The British have Princess Charlotte, but Princess Cruises now has a Chinese Princess on the way. Fincantieri laid the keel today for the third Royal-class ship for Princess which will be dedicated to the China market. But it wasn’t your normal keel laying. 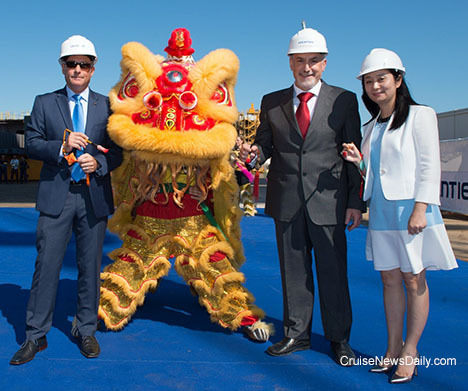 Fincantieri's Shipyard Director (Middle) and Cherry Wang, Carnival's Country Director for China (right). Most cruise ships calling at Bermuda these days are just too large to dock in Hamilton so they tie up at West End - way, way out of town. Next year, Holland America will return to Bermuda, but they will operate their cruises from Boston with Veendam, which is still a size that can dock right in town in Hamilton, just a short walk to Front Street, giving Holland America’s passengers an entirely different experience from lines operating larger ships. MSC Cruises said today they are extending their suspension of calls at Tunisian ports through the winter 2015/2016 season. The complete story appeared in the July 9 edition of Cruise News Daily. Silversea has scheduled the 28,000-ton Silver Whisper to operate their 2017 World Cruise. The 116-day itinerary will take passengers from San Francisco in a westward direction to Monte Carlo, departing on January 6, 2017. The program takes passengers to 67 ports in 25 countries. Celebrity Cruises is partnering with Lifetime’s Emmy-nominated show Project Runway for the 16th season of the series. Details appeared in the July 9 edition of Cruise News Daily. Last weekend was a holiday weekend in the US, and few people on this side of the Atlantic noticed, but history began to unfold. Saturday was the 175th anniversary of Cunard’s first transatlantic crossing, and the line was recreating it, albeit in a much different style. On Saturday, 175 years to the day after Cunard’s first liner, Britannia, set sail for Halifax and Boston, Cunard’s current flagship, Queen Mary 2 also sailed from Liverpool bound for the same destinations and New York. The complete story appeared in the July 8 edition of Cruise News Daily. Noted maritime historian John Maxtone-Graham died Monday at his home in New York. Holland America's Rotterdam made its 100th call on the city for which it was named on July 4. Details appeared in the July 8 edition of Cruise News Daily. A pier being built on the Kamchatka Peninsula sized to handle large cruise ships, which the Russian Federal Tourism Agency says they will market specifically to cruise lines with ships calling at Alaska's Aleutian Islands. Fincantieri's Monfalcone yard reopened today after an Italian investigation into environmental practices with regard to waste processing at the yard. The entire yard had been idled since July 1. Details appeared in the July 7 edition of Cruise News Daily. Carnival Corp said today that the US government last Thursday approved their plans to operate cruise programs to Cuba with their recently-created fathom brand beginning next May. The company is now working with the Cuban government to secure their approval, which is expected in due course. Surprisingly, the new program does not owe its existence to the new relaxation of restrictions by the Obama administration. It’s being operated under exemptions which have been available for some time allowing Americans to travel to Cuba for educational and cultural exchange purposes. The cruises therefore will be quite different from standard Caribbean cruises, and still in line with the fathom product to the Dominican Republic. Royal Caribbean said this morning that instead of Majesty of the Seas transferring to the company’s Pullmantur brand, it will remain with Royal Caribbean International to continue sailing short cruises. It will get a major upgrade and then move to Port Canaveral next summer. But there’s also something in the deal for Tampa. The complete story appeared in the July 6 edition of Cruise News Daily. A 27-year-old crew member from Brazil went overboard from Norwegian Sun in Alaska on Thursday south of Douglas Island. Details appeared in the July 6 edition of Cruise News Daily. MSC Opera just returned to service on July 4 after a dry dock to lengthen and refurbish the ship. The line announced a change of deployment for this winter’s service. The ship will now be homeported at Havana for 16 weeks, but it’s not the Cuban itinerary US lines have been dreaming of for when the island opens to American vacationers. That one would visit several Cuban ports in various parts of the country as the ship circles the island. MSC Opera’s itinerary is a fairly standard western Caribbean itinerary, but it’s an important move for the line.